Mooditations Daily Meditation Program: Re-wire your brain with our guided meditations for better health and overall well-being, improved memory, relaxation and lasting relief from stress. meditations created by Leah Marie. meet your daily meditation needs for optimal wellness and a positive state of being. This program will help you find contentment and a feeling of well-being on all levels of existence...physical, mental, emotional and spiritual. the body and help us live in a HEALTHY state of inner peace. Each Mooditation Meditation is approximately 12-15 minutes in length, as recommended by some of the top brain researchers in the world. Included in the full program package is an overview of meditation and how it can positively impact one's well-being while providing stress relief, brain health, relaxation and to assist in getting some good quality deep sleep. 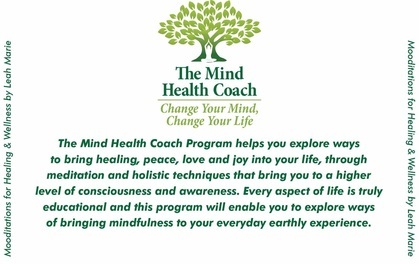 Change your life with Mooditations Daily Meditation Program and other Mind Health Coach Programs today! All 7 of these well-being guided meditations work together to balance all levels of your existence, allowing you to transform your life from the inside out. Designed for relaxation, improved health and well-being, relief from stress and anxiety, to promote inner peace and also to achieve a deeper level of sleep. Learn why the ancient practice of meditation is being recommended by medical researchers from Harvard Medical School, Mass General Hospital, the Alzheimer’s Research and Prevention Foundation and even the US Department of Health and Human Services to name a few. 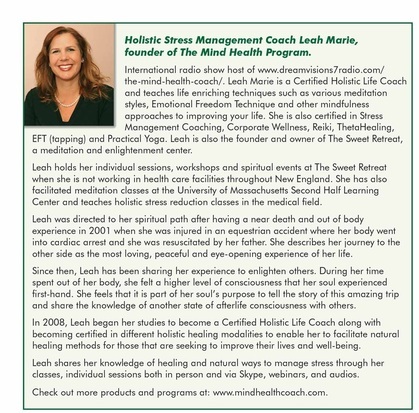 Leah Marie will introduce concepts and studies regarding meditation practices and its positive effects on your health and happiness. 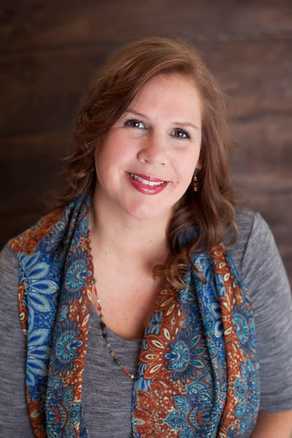 Leah Marie also explains the different types of meditative practices, the health benefits that result from this ancient technique and how it can positively affect your life, your relationships and the world. ​Mood Results - Calm, Rejuvenated, Refreshed! Immerse yourself in the beauty of nature and take a moment to connect with your breath on a level that will allow you to cleanse your being completely down to a cellular level. Also, feel yourself guided to connect to the beautiful resources that provide the gift of pure oxygen helping you experience an overwhelming state of gratitude. Travel to your favorite beach and make a divine connection that will give you keys to get CREATIVE! Use your imagination and co- create a beautiful and fulfilling life filled with inner peace and joy. This meditation experience promises to uplift and and inspire you to finally claim your perfect state of you! Allow yourself to delve into a world of peace and love where you can create a painting of your inner beauty and see yourself as you truly are...experience your true ESSENCE and tune into the purpose of your soul. This meditation will help you to love and appreciate yourself on a much more intimate level. Develop a more loving life for yourself and gratitude for those around you. ​Mood Results-Grateful, Appreciative, Content, Happy! Take an inner journey that will give you the opportunity to send the energy of loving gratitude to each part of your physical being, your energy body, your external world, your history, your present time and your future. This is an excellent meditation to recognize the miracle of life and can help inspire healing within you during times that you need to be reminded of how amazing you are! ​Experience raw nature in this guided meditation and allow the Universe's natural elements to heighten your meditative state and receptiveness to the outer world. Nature can provide us with many answers that we are searching for. Take this time to contemplate any situations in your life that you are seeking resolutions for, experience a message from your inner intuitive or enjoy a time of reflection as you take this exciting journey within. A mindful meditation that helps you explore the sensations of your physical being and guides you into a state of total relaxation that spreads to every part of your body. This meditation is wonderful if you want to de-stress or if you need some help getting to sleep. Take this opportunity to be guided into a state that will open you to a beautiful divine experience with the energy of pure love. This meditation will help you to get in touch with your higher self and allow you to receive guidance from above on any situation. You will be filled with whatever necessary wisdom and knowledge you need to fulfill your next steps on your personal journey.